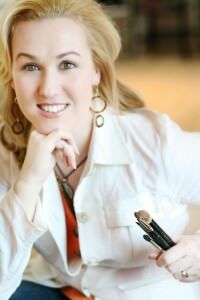 HOW: As a department store makeup artist, Alyson Hoag saw beautiful women come to her counter each day. They’d look in a mirror, after having makeup put on, and start talking about eye lifts and nose jobs… things that Hoag didn’t like to hear at all. “I had been sitting on an idea I had that could transform the way the beauty industry does business,” says Hoag. From where makeup is sold to the environmental impact of an eye shadow, Hoag developed an idea for a beauty business that would encourage women to use makeup to enhance their features – not cover them up. Fully aware that she was far from business-savvy, Hoag began to educate herself using as many resources as possible. After taking seminars, meeting with business coaches and potential investors, Hoag developed a plan – and began executing it. “I took out four-year loans in $10,000 increments,” says Hoag, with the goal of finding investors to help cover the remainder of her expenses. However, Hoag was met with another obstacle – “we sent out our investment packets as the market began to fall.” Only able to raise $50,000 on top of her loans, Hoag put in a lot of sweat equity to get the business off the ground. Working as a personal trainer, the mother of two launched her business in the basement of the athletic club where she worked. Building her list of clients as well as her reputation, Hoag began to move up – all the way to her own studio space within a busy hair salon in Atlanta. Since then, she’s achieved a great deal of success in and out of the city, having been profiled in numerous magazines and newspapers, and has expanded her business to include wedding and party service as well. She also developed a full product line that includes everything from foundation to lipstick – and all of her products are eco-friendly and non-toxic.